or perhaps “Good things come in threes”, or maybe “Three times a charm”? But I am not here to merely quote random sayings associated with the number three! I want to look at how the combination of three elements can be utilised to produce engaging learning programmes, that really work. We as L&D professionals are under even more pressure than ever to deliver learning solutions that deliver impactful business results. But in a world of Facebook, What’s App and Twitter, how do you create high impact learning applications which deliver content in the same way as these multi-billion dollar consumer technology apps? Remember your first memories of parents reading to you at bedtime, or sitting on the reading mat at school at the end of the day. Story telling can capture our hearts and imaginations and engage us in a way unlike any other. The fundamental concepts of a story are pretty much constant whether we’re creating a story for children or adult learners. It needs to have relevance, context and structure. There are some great resources available about how to create stories within learning and I would highly recommend taking a look at this article on 7 tips to integrate storytelling in your next eLearning course. So now you have your scenario, we can tap into our competitive nature by using gamification techniques to propel the learner through the learning programme. We can set our learners challenges, which they have to pass so that they can unlock the next chapter of the story. And reward them with badges as they progress through learning resources. 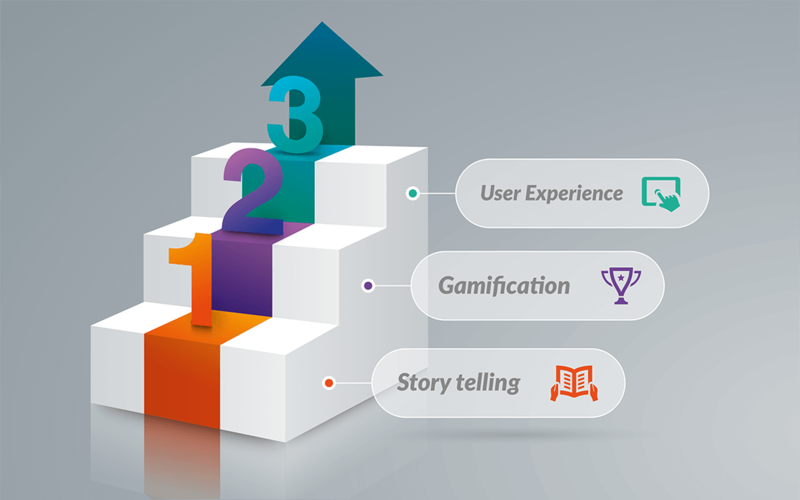 The concept of gamification is proven across many aspects of business but it has particular relevance within learning, as we try to motivate and engage our learners. Lastly, we need to think about the User Experience or UX. Recently there have been discussions around a movement away from traditional instructional design to learner-centred design, which is more aligned with UX. Creating solutions which put the designer in the learner’s shoes and focusing on decision the learner will make in the design process. Think of the UX of some of your favourite consumer apps at home and consider how we can create learning apps of a similar quality. For more around the increasing importance of UX in learner-centred design, please take a look at this post on our blog site, i-lovelearning.com. So there we have it, the power of three! I will be expanding on these concepts during an interactive workshop at LearningLive in September, or you can also review a recent webinar recording for more information.